Mesopotamia Daily Life in Sumer - HISTORY'S HISTORIESYou are history. We are the future. Ancient Sumer was a bustling place. The cities were built along the Tigris and the Euphrates Rivers. Long docks were built along the sides of the rivers so that ships could easily dock and unload the goods they had to trade. Ships brought food, drinks, clothes, jewelry, wine, and other goods up and down the rivers. Banquets with music and dancing were frequent. At such celebrations, poets would recite verses about great kingly deeds and golden cups filled with sweet delicious date wine would be lifted to toast the hosts. Art: The Sumerians were wonderful at their crafts. They made jewelry out of precious gold and lapis lazuli, as well as fancy chairs, and unglazed vases that kept water cool. They were not very good at sculptures because their artists did not have stone with which to work. But they made beautiful things with the materials on hand. Creating colorful mosaics in intricate and beautiful patterns using little pieces of painted clay was one of the things they did very well. Archaeologists have found remains of their mosaics, helmets, harps, jewelry, pottery, decorated tablets and cylinder seals. CLICK above to view some Sumerian works of art. How did Sumerians honor their gods? Religion: The Sumerians were polytheistic. That means that they believed in many, many gods. They believed that everything that happened to them - good and bad - was the result of a god's pleasure or displeasure. Their daily life was spent seeking ways to please their gods. It was common for a Mesopotamian home to include a shrine, a place to honor the gods. A city of any size also had a ziggurat that, in addition to other public functions, served as a temple. Ziggurats: The Sumerians believed that powerful gods lived high up in the sky atop the mountains in the distance. Because of that belief, the Sumerians built huge structures called ziggurats to bring them closer to the gods. The ziggurats looked like a "stepped pyramid" and were built to resemble the mountains that the Sumerians could see in the distance. The word, ziggurat, means "mountain of the gods." CLICK above to view a 3D cad tour of a ziggurat. Ziggurats had stairs climbing up to the top where a special temple was decorated with blue tiles to resemble the sky. Only priests could ascend to that uppermost level. It was there that the priests conducted religious ceremonies. Sumerians regularly went to the ziggurat to leave offerings for the gods. Usually, such offerings were food or wine. Because the gods could not eat for themselves, the priests enjoyed those offerings. The ziggurat was built in the center of town. It was also the center of daily life. Except for festivals, which, for the most part, were gloomy things, the ziggurat's courtyard was lively and fun. You might see an artist painting, a boy racing by on his way to school, or someone milking a cow or making a basket. From the top of the ziggurat, you could see the protective wall built around the entire town and, over the wall, you would look out to the farmlands beyond. Why was education so important to the Sumerians? The Sumerians highly valued their education. Then, as now, education was the ticket to a better life. CLICK to explore the world of a scribe. Education: The ancient Sumerians believed in education. Record keeping was very important to them. They wrote everything down. They wanted their sons to learn how to read and write. Public education probably began with the Sumerians. Schools were attached to temples. Only boys went to school. Teachers were very strict. Students had to do a perfect job, or they were punished. Because someone who could read and write could always find a good job, most students wanted to go to school. Social Classes: There were four main classes of people in ancient Sumer: the priests, the upper class, the lower class, and the slaves. Why were priests powerful in ancient Sumer? The Priests: The Sumerians believed that all forces of nature were alive. Because they could not control the forces of nature, they viewed such forces as the will of gods. Remember, the Sumerians were polytheistic. They had more than 3,000 gods and goddesses. Only priests could know the gods' will. Therefore, priests were in charge of making sure everyone behaved in a way that would make the gods happy. Because of this, Sumerian priests were very powerful. Because the Sumerians believed that the gods owned all of the land, one way that priests exercised their power was by administering the land in the god's name. The priests also ran schools and were considered the doctors of the time. If you were sick, you called for a priest. There is a written record of two priests, by the bed of a sick boy, dressed to look like fish to better speak with the water god. The Upper Class: Men and women wore jewelry, especially rings. Men wore skirts and had long hair, curly mustaches, and long beards. Women wore dresses, off one shoulder. They had long hair, which they braided or wore up in fancy arrangements. It was easy to tell who was a priest. The priests shaved their heads. Everyone wore cloaks made from sheep wool to keep warm in winter. Homes: The rich lived in large homes, and the poor lived in small homes. Most homes were clustered around the ziggurat and each other. Most houses shared walls, like townhouses do today. There was little wood or stone available for use as building materials, so city people built their homes of sun-dried mud bricks. Doors led into a small family courtyard and then to the roof. The roofs were flat. When weather permitted, people cooked and slept on their roofs. As the cities grew, rich and poor sections of town developed, but all families had a home of their own. Cutaway of a typical Sumerian home. 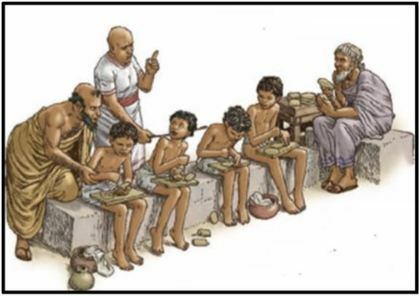 The Lower Class: In ancient Sumer, people were paid for their work. If they ran a shop or worked in the fields, they were paid for their goods or labor. Stealing was a serious crime and punishment was severe. Everybody paid for the things they received, even the king. Although the lower class did not have the luxurious lifestyle of the rich, they were comfortable. They worked very hard, but they had homes. They followed the clothing fashions of the time as much as possible. They wore jewelry, although perhaps it was not made of gold. There was no law that said the lower class could not move up the social scale, and most worked hard so that their children could move up the social scale by becoming a scribe, or a priest or priestess. 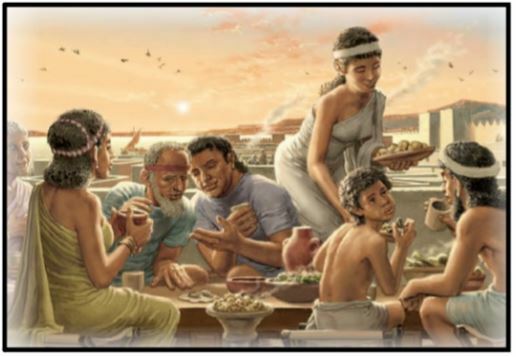 The Slaves: When the Sumerians conquered another town, they brought prisoners back with them to serve as slaves. Slaves worked for the king, the temple, and the wealthy. Slaves were bought and sold. Records have been found recording the amount paid for a slave. Typically, a slave bought at auction cost less than a donkey but more than a cow. How did the rights of women compare to the rights of men in ancient Sumer? Women: Women could freely go to the marketplace, buy and sell goods, handle legal issues, own property, and start their own business. Upper class women, like members of the royal family and those who gave their life to the temple as priestesses, could learn how to read and write. Some women even had jobs running parts of the town or jobs in city government. There were many female goddesses. Some cities selected a goddess rather than a god as their patron. Women were not equal to men, but they did have rights. The Standard of Ur: The Standard of Ur is a magnificent piece of Sumerian art discovered by Leonard Wooley in the Royal Tombs of Ur. It depicts social classes in ancient Sumer. The pictures below show the two sides of the Standard of Ur. On the left is the "Peace" side. On the right is the "War" side. The Peace side represents the Sumerian society and its three divisions of social classes (Upper, Middle, and Lower). The War side represents the different classes of the Sumerian Army (Chariots, Soldiers, and Warriors).